After coming off the previous month where I made no decisions to buy or sell stocks and ETF’s in my portfolio, February couldn’t be more opposite. The trigger that got me to move was the louder chatter that the Federal Reserve was going to put the breaks on any future interest rate increases. To me this sudden 180 degree shift by the Federal Reserve was a game changer for the markets. By freezing rates, the Federal Reserve set a cap for the US dollar and in fact has set the stage for the US dollar to fall. If this dynamic were to hold true, the it could start to put upward pressure on hard assets and commodities such as oil and gold. With steady interest rates, money could also start flowing outside the US to other parts of the world, like the Emerging Markets. A downside to this is that a falling US dollar would erode value in the US$ based assets that I have in my portfolio. I needed to consider a mechanism to hedge some of that currency risk out of the portfolio. It’s this dynamic, that convinced me to start allocating some money to hard assets and also to crudely hedge some of my currency exposure. My thought process was to buy a gold ETF to hedge some of my US dollar currency exposure. If the US dollar were to fall going forward, the value of my US dollar assets would fall. To counter this I would buy gold which would go up when the US dollar falls, thus tempering some of the currency erosion. It’s a crude approach and is not 100 percent correlated. That is why I partially hedge my exposure, in the event that it doesn’t play out and the US dollar remains steady or increases, at least I can continue to partially benefit. Again, playing off the falling US dollar play. Emerging Markets stocks may start getting more attractive as money leaves the US looking for higher yield. Instead of looking for individual Emerging Market stocks, I decided to buy a cheap ETF that would give me a broad exposure to the region. I followed my analysis of Emerging Market ETF’s that I posted awhile ago. The Vanguard product seemed to be the best of breed ETF so I decided to open a small position. Playing off the lower US dollar theme, I decided to start building my exposure to owning rocks and oil stocks again. Southern Copper is a stock I’ve owned in the past as pure play exposure to copper. The stock has been down quite dramatically to the low $30’s so I decided to explore whether to buy in. Below is my mind-map video that led me to my decision to open a small position. I also decided that I wanted to get exposure to oil stocks. From my recent analysis of Energy ETF’s, I found that the ETF’s were quite concentrated in their ownership, where 1-2 companies represented almost half of the portfolio. I decided that it would be cheaper to own one or two of those concentrated stocks instead of the whole basket. My analysis lead me to review one of those stocks which was Canadian Natural Resources. Below is my mind-map analysis. In the melt-up of stocks over since December, the one sector that has been lagging has the been the pharmaceuticals and drug stocks. The Mad King has been taking shots at the sector, vowing to reign in drug prices. The pharma ETF’s have been languishing. I thought that this may be a good time to jump back in and get some exposure in the space. 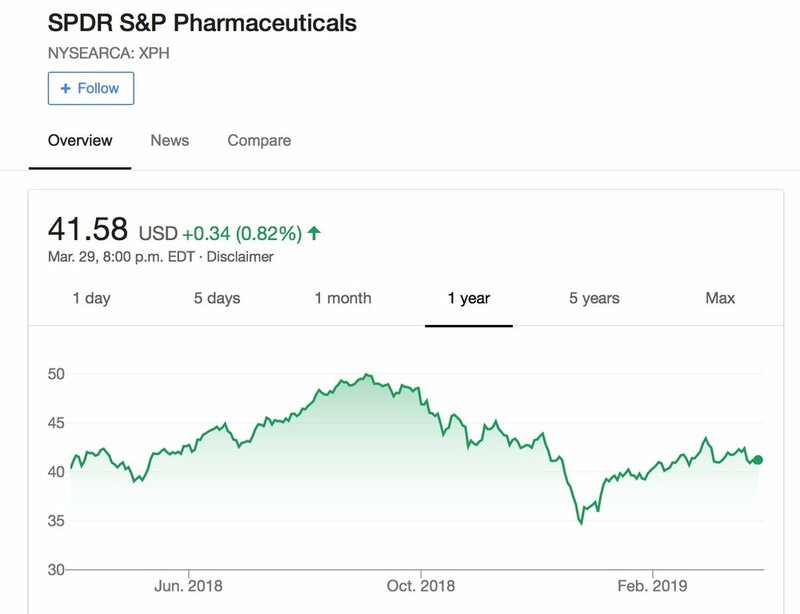 In my last iteration with pharma stocks, I made the decision to buy a basket of pharm stocks through the iShares Pharmaceutical ETF. Below is the mind-map video of Pharma ETF’s. The stock price is back to the level I bought in last time, so I decided this may be a good time to buy back in. Again with the promise of cheap money, drug stocks may get little tail wind. I really wasn’t expecting to get back in to commodity stocks or buying gold stocks to hedge my portfolio, but the signalling that came from the Federal Reserve forced me to pivot and start looking at the space. That’s the way investing goes. You have to play off what the market is doing, often zigging when the market is zagging.